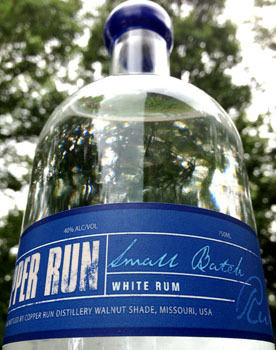 Copper Run Distillery is proud to present a White Rum. Made from brown sugar and blackstrap molasses, this tasty un-aged Rum is ideal for all your cocktails this summer! Aroma: overtones of Molasses, dried figs, crème brulèe and cake-batter. Overall: This young and spirited White Rum instantly wakes up your senses. Aromas of cooked sugar float around the glass, surprisingly becoming tingly, exotic, spicy, and full of flavor. Copper Run’s White Rum is ready for the Summer! Enjoy! Buy White Rum Online Now! CLICK HERE!